Question 1 What is ammonification? 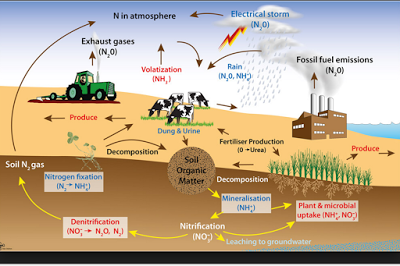 Question 2 What is nitrification? Question 3 What is denitrification? Question 4 Draw nitrogen cycle? Question 5 Name a nitrogen fixing bacteria of non-leguminous plants? Question 6 Define nitrogen fixation? Question 7 Explain nitrogen cycle? 78% of our atmosphere is nitrogen. Nitrogen is a part of many molecules essential to life like proteins,Nucleic acid(DNA and RNA) and some vitamins. It is found in alkaloids,urea. (1) Aerial nitrogen cannot be used as such by majority of organism. (2) There are certain bacteria which convert this inert nitrogen into nitrates and nitrites which can be taken up and used to make required molecules. (3) During lightning the high temperature and pressure created in the air converts nitrogen into oxides of nitrogen.These oxides dissolve in water to give nitric and nitrous acid and fall on land along with rain. (5) When animals consume plant matter,they break down the plant’s nitrogenous compounds and use them to form new animal proteins. (6) After an animal excretes urea or uric acid or after an animal or plant dies,certain bacteria carry out ammonification ie they produce ammonium ions from nitrogen containing molecules. (7) Plants can then assimilate this ammonium ion or still other bacteria can change it to nitrate by nitrification. The process of ammonia formation is called ammonification.Some micro-organism(nitrobacteria, nitrosomonas)convert ammonia into nitrates.The process is called nitrification. There are certain bacteria which reduce nitrates back to nitrogen or to ammonia or to some other oxides.This process is called denitrification. Really well explained point by point, thank you.